AS Magenta were the only side to pick up three points from their opening match in Honiara, but they’ll need to do the business again tomorrow against the home side Marist if they want to keep their OFC Champions League campaign alive. Team Wellington are also keen to secure a win and keep the dream alive, after dropping their first ever Group Stage points in the draw with Marist, when they face Samoa club champions Lupe Ole Soaga in the opening match at Lawson Tama tomorrow. In the three previous OFC Champions League editions they’ve featured in, Team Wellington had never lost or drawn a match which makes the 1-1 draw against the favourites from New Zealand a feat for Marist. However it means things will be even tougher for Paul Ualesi’s Lupe Ole Soaga side as their opponents push to secure the sought after three points and set the ship back on course for quarterfinal qualification. “We know it’s a big challenge, a huge challenge,” Ualesi said. Having seen a fairly solid display from Lupe Ole Soaga defensively, and some threatening counter attacks, Team Wellington’s Jose Figueira knows it won’t be a simple job. However he said his side is determined to register a win tomorrow afternoon. “We’re feeling a lot more comfortable and having a game under our belts as well helps, we’re that much more prepared and looking that much sharper for tomorrow’s game,” Figueira said. Following the opener between Lupe Ole Soaga and Team Wellington, home side Marist will gear up for their second match of the tournament against AS Magenta – who are hoping they’ll still have their lead on the table after this encounter. Magenta coach Alain Moizan wasn’t 100 per cent happy with his side’s performance despite picking up the three points, believing them to have let a lot of chances go astray which he put down to a lack of desire. After a couple of days rest and time to reflect on that first outing, he hopes the team show greater conviction against Marist. “We’re ready, yes. We prepare for this so it will be an exciting match to play,” Moizan said. “Marist seemed to sit and wait for the Wellington team and they had to the opportunity to score first which was good, because it meant Wellington had to come back. Marist let a one goal lead slip from their grasp meaning they had to share the points with their opponent on Saturday. Coach Jerry Allen doesn’t want to see a repeat. “I think during the first game we played well but we didn’t score our chances,” he said. “I think tomorrow it’s going to be a tough game for us as well. They want the three points, us, we want the three points. I know how they play and we’ll be doing a lot of running, they’ll try to play our wide and go for crosses. Team Wellington and Lupe Ole Soaga will open the action of Match Day 2 at 1pm before Marist play AS Magenta at 4pm. Vital Statistics: The only other occasion in which Team Wellington has drawn an OFC Champions League match was the 2015 final against Auckland City in Fiji. They went on to lose that match in a penalty shootout, but have otherwise not dropped a point in the Group Stage previously. The Players: Goalkeeper Scott Basalaj was fortunate Marist’s strike force were having an off day. 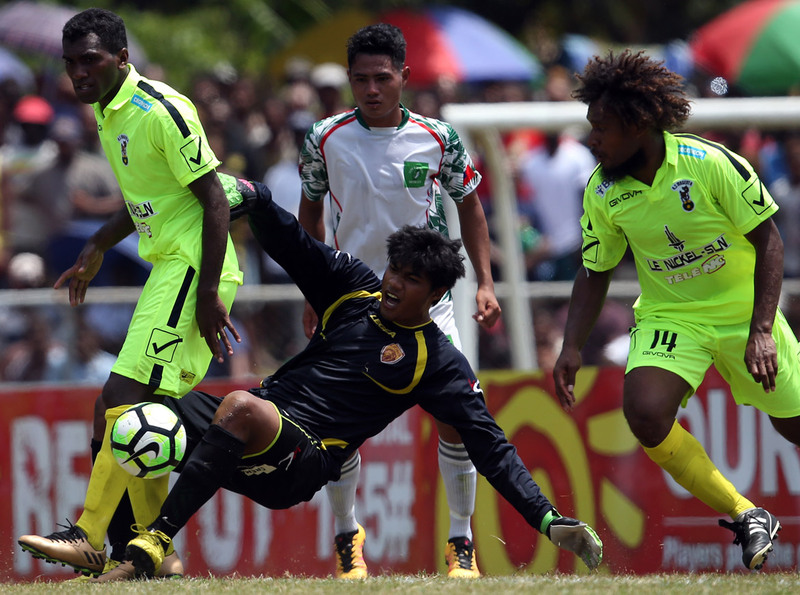 Nonetheless, he showed great reflexes and an understanding of the unpredictable nature of Solomon Islands footballers to keep his side in the game. Vital Statistics: Lupe Ole Soaga has never met a New Zealand club side in the OFC Champions League Group Stage. The Players: Faalavelave Matagi’s pursuits between the sticks for Lupe kept his side in the game against AS Magenta and prevented a runaway victory for their opponents. Defender Lawrie Letutusa will be back after serving his one match suspension which will help shore up the backline. Vital Statistics: At 38 years old, Marist Match Day 1 goal scorer Abraham Iniga is one of this edition’s oldest players. The Players: Atkin Kaua was creative and quick out wide. Captain Henry Fa’arodo did a lot of leg work through the centre and will be a big loss if he doesn’t recover from the injury he picked up in time to play Magenta. Vital Statistics: AS Magenta has never met a club from the Solomon Islands in the OFC Champions League. The Players: Jean-Christ Wajoka stepped in as interim captain while Jean-Brice Wadriako served a suspension. He put in an excellent shift keeping things organised at the back, but after picking up a silly caution at the tail-end of the match will need to keep a cool head to help his side through the group.